SBDU frames and the TI colours have become hugely popular. More people are seeking to buy an SBDU frame and recreate the red black and yellow TI-Raleigh scheme. With this recent resurgence, sellers are looking to sell and buyers are readily buying. The demand for these frames is producing a seemingly never ending supply of TI painted frames. With so many looking to buy and then repaint, and so many looking to repaint and then sell, the amount of freshly painted frames I’ve seen recently by both buyers and sellers has spiralled. My concern based on what I’ve seen is that the detail of the SBDU TI scheme is in danger of being lost forever. The TI colours didn’t just last for a couple of years, it was in use as the current “Team” colours from the early 1970s, right up to the end of 1983 when the team colours changed to Panasonic. The longevity and success of the team are probably the reason it appeals to so many. Unfortunately, there are only a few examples of original paint SB numbered frames with original transfers remaining, and the rush to renovate with new glossy red paint means that the dwindling pool of originality is in danger of extinction. The problems fueling my growing concerns are that new restorations appear to be getting based on either previous restorations or different Raleigh models. It’s similar to Chinese Whispers where a story is passed on from person to person and the final story is completely different to the original as every person adds or removes their own detail. Mistakes are creeping into the SB TI scheme and these mistakes are being perpetuated and are becoming the new norm. The reproduction transfers used on some SB TI restorations are sometimes being reproduced by using other reproduction transfers as the basis for the copy. The TI scheme was a huge win win for Raleigh and they applied the TI scheme in slightly different ways to a broad range of bikes for a long time, the Europa, Record, Rapide, Competition, Professional and Team Replica to name just a few. I’ve purposely used images of a renovation as the cover image of this blog post because although the bike itself looks great, 99% of it is wrong. Most of the transfers are in the wrong location and some of them shouldn’t even be on there based on the age of the frame. I’ll explain more about that particular bike at the end of this post but only once I’ve gone though each part of the SB TI scheme transfer by transfer. When it comes to an SBDU frame, the original TI detail is definitely disappearing. The few original frames out there hold all the secrets to how this scheme should look. When it comes to paint and transfers, you probably won’t be too surprised to know what my own preference is… I try and keep everything as original as possible. The paint and transfers you see in the images above show the life of this frame, the paint and transfers were applied at Ilkeston and has been ridden hard, there are stories associated with all the marks and rubs on this frame, but ultimately, it is still very recognisable as a TI Raleigh, you cannot mistake it! So why paint it? Original SBDU paint, in my mind, will hold the most value; SB3505, SB5084 and SB1861 are great examples of TI-Raleigh originality. If you have a frame like this then please think about why you might want to renovate it. With a little bit of time and attention that frame was preserved and turned out beautifully, a 40 year old frame ready for another 40 years. All original, all period, all correct and all how it was when it came out of Ilkeston’s SBDU, just a bit more aged. ESPECIALLY think twice if your frame has any kind of provenance; if you repaint, you will lose a bit of that history and story. If you really have the urge to restore then please be faithful to the original. Personally I would only consider doing a restoration if I could have it period correct; for me it isn’t just about making sure the bike is painted in the colours, it is also about being faithful to the SBDU and to the men who created and built these. Spend time getting the style and location of transfers correct, if I was painting a 1975 frame then I would want it to look like a 1975 frame, likewise, if I’m painting a 1977 frame then for me it should look like a 1977 frame. Which Team/Team Raleigh/Raleigh/TI-Raleigh transfers should I fit? Where do I fit them? Should I detail the lugs with contrasting paint? What colours should I use to detail them? If I detail the lugs then where else should be detailed and what colour should I use? Which Reynolds frame transfer should I use and where should that be placed? Should I use Reynolds transfers on fork blades? If I use Reynolds transfers on fork blades then which type do I use? Where should the circular TI transfers go and what colour should they be? Was there always 4 black and white bands on the seat tube? Is there a specific location for the SBDU oval transfer? What head badge is correct? What transfer should go at the base of the seat tube and where should it be? What transfer should go between the gear levers at the tip of the head lug, if any? Do I fit a GvO’D transfer? All of these questions have a different response depending on the period of your frame. Some of the answers are probably not what you might be expecting. The SBDU TI-Raleigh scheme clearly wasn’t a ‘catch all’, it did change. If you are spending hundreds of pounds on a restoration then you may as well do it once and do it correctly, right? I’ve put together a guide to show what would be considered period correct restorations. If you want to reach geek level, I might even have gone as far as being able to demonstrate the different order that the red black and yellow paint was applied over the years. I get sent lots of images of Ilkeston built bikes. I also get lots of requests asking me to judge and give an opinion if bikes are original or repaints. With time I’ve built up the experience to spot the signs of original paint and original transfers, I’ve become familiar with things that look out of place. I started to record every frame I was sent or which appeared for sale, and categorised each frame into about 120 pieces of individual data which I use for my date and frame detail time line. When I started this current project, I created another set of data just for the SBDU TI-Raleigh scheme itself, this has been divided into 35 different pieces of information. This process hasn’t been easy! There are only a few original paint SBDU TI-Raleigh bikes out there compared to the amount that would have been painted like this originally during the 74-83 period. Those last few original examples are disappearing fast… even as I write this post original bikes are being repainted. Added to the dwindling amount of available original examples, there is always the possibility that an original paint frame may have had replacement transfers fitted at some point; after all, transfers get scrubbed and scratched and gradually deteriorate, fitting new transfers has always been a quick and inexpensive way to breathe new life into a frame. It’s relatively easy to remove damaged transfers and fit new. I know that some original paint bikes do have replacement transfers, owners have told me so. Because of this problem, I’ve been careful and I’ve made sure that I spotted these bikes. Replacement transfers can also occasionally show up as anomalies in my data, for example, a frame (or line of data) that is clearly different, sitting in the middle of a standard set of data is often due to replacement transfers and jumps out at you. My own collection has also been used as a reference. I have a good selection of original paint frames and I’ve purposely left them like this to use as a valuable reference point. I’ve only looked at frames with SB frame numbers. That is important to note, it means that I’ve not included any other non SBDU Raleigh produced models that used a variation of the TI scheme. I’ve also not included any actual TI-Raleigh professional riders TEAM bikes. Just like the physical frame details such as lugs and fork crowns, SB frames in the TI scheme followed patterns, but the professional riders TEAM bikes didn’t, the TEAM bikes had a tendency to use random transfers in random locations, and therefore can’t be used. If you want to restore a specific TEAM riders bike then you really need to find images of that actual bike being ridden to see how it should look. This summary only covers SB numbered bikes, it doesn’t apply to any other Raleigh model from any other production facility. Each one of the 100 original frames I’ve looked at has been categorised using my 35 individual points of data as a reference to record them against the TI scheme, and as I expected, that data shows definite patterns and trends. I’ve then linked this information with the frame data I already have relating to items such as type of lug, braze on fittings, bottom brackets and tubing type. The combined results of all of this has given me a very clear understanding of what transfers should be used, when they should be used and where they should be placed depending on the frame number range of an SB frame. Please bare with me, there is a large amount of data to get across, I’ll try not to ramble but occasionally I’m sure I will. If you want to skip to a specific transfer type then just click the respective heading in the numbered list below. I might also leave a comment or a note on some sections; ‘comments’ are things that are ok to do, ‘notes’ are something that you need to be aware of or definately try to avoid. I’ve only used my own bike images in this blog post. The 100 original frames I’ve looked at for this project all correspond with each other and all correspond with my own original bikes so I’m confident that all the frames I’ve looked at all exhibit the correct SB TI style. Caveat – clearly the SBDU were a custom build unit and from what I have witnessed, all these frames display the same features. However, I only have a small sample to work with and undoubtedly there will be bikes and frames out there that I haven’t seen which may differ to my findings. If you have something that differs I would love to see some good images. ** Comment ** The correct head badge for an SB numbered TI-Raleigh road frame between 1974 and 1983 is the traditional 3 external rivet type. There is only one head badge appropriate to SB road frames painted in the TI-Scheme, covering the original TI period (1974 to end of 1983). Every single original paint SB road frame I’ve looked at in TI colours uses the traditional Raleigh Heron attached with three external rivets. The four original examples below are from 1977, 1978, 1980 and 1982. By the start of 1984, the TI-Raleigh scheme had become known as the ‘Old Team Colours’ as it had been replaced by the Panasonic Raleigh team. But even 1984 new team colour Panasonic frames and old team colour TI frames continued to use the original 3-pin type head badge. The SBDU eventually changed to the newer hidden 2-pin type of head badge soon after the start of 1985, at approx SB7200. If your SB road frame dates to a period between 1974 and start of 1985 then the the 3 rivet type is correct. If your frame dates from early 1985 (circa SB7200+) then the hidden 2-pin type is correct. ** DON’T ** There is no evidence of original SB numbered TI scheme road frames dating between 1974 and 1983 using any other type of head badge. The alternative large oval foil type badge was typically used for Time Trial frames & other SBDU Specials. It also occasionally featured on some TI Team frames. ** Comment ** At the moment, according to what is known, any SB frame in TI colours from SB51 should have a black head tube. There are only a few original paint SB frames with a yellow head tube. It is a generally accepted assumption that the head tube was changed to black at the start of 1975 (approx SB50). SB15, SB19 and SB28 are in original condition and have a yellow head tube. SB15 was recently discovered and had a black head tube but some careful paint removal has revealed the original yellow colour hiding underneath. Unfortunately, the next available frame is SB48 which sadly is a repaint and has a black head tube and also uses later style TI transfers. It appears to have been renovated to mimic the later TI style (post 1978 appearance). I received an email recently regarding SB50 which the owner claimed to be in original condition, but at the moment I’ve not had a reply – hopefully this frame could help to narrow down the yellow/black head tube switch over. I’ll mention the head tube again under Section 10 – Paint Process. There were at least three different methods of painting the TI scheme and the way the frame was masked and painted affects how the head tube and the colour of the head lug edge adjacent to the head tube appears. ** NOTE ** There is sometimes some confusion about when the yellow head tube ceased. The confusion appears to be based on the fact that Raleigh stopped using the yellow head tube on SBDU frames but continued to us it on other non SBDU Raleigh’s after the end of 1974. ** Comment ** Reynolds frame transfers should be fitted approx 4-5 mm below the tip of the seat lug on SB frames. Regardless of the age of your SB frame, the TI scheme applied by the SBDU only had one general location for the Reynolds frame transfer. It should never be at the base of the seat tube like a Panasonic frame or at the top of the down tube like some Worksop/Nottingham frames; it is always just below the tip of the seat lug, similar to the original transfer in the image below. These original Reynolds transfers can shrink, split & deteriorate over time. They can also slip and move but the evidence is quite clear from transfers that have survived, they show that the correct location is 4-5 mm below the lug tip. If a frame is small or the transfer has slipped then the position may be right on the tip of the lug. Some SB frames have lugs without points, Carlton Capella is an example. If you are fitting a Reynolds transfer to a Capella lugged SB frame then the gap between the top of the transfer and rounded base of the lug should be approx 10-15 mm. Don’t be tempted to fit a frame transfer mid distance between the seat lug tip and upper seat tube band on a SB frame. ** NOTE ** There is little evidence of Reynolds transfers fitted to SB frames lower than 5 mm from the point of the seat lug. ** Comment ** Reynolds 531 Double Butted frame transfers in this period fitted to SB frames should be the sloping/diagonal 531 type. The SBDU started in the period of the “Reynolds Tube Company Ltd”. Reynolds used this name until 1977. SBDU Reynolds 531 double butted frames should use one of two transfers. The styles shown below are the choices that came from Reynolds, but only two of these four options are acceptable for this period of 531DB SB frame. Based on original frames, SB1 – SB1650 (1974 – Mid to late 1977) 531 frames can use either the original diagonal 531 transfer without the lower name box, or the type with the added lower name box. If you do use the type with the name box then the name displayed should be “Reynolds Tube Co Ltd”. The name box at the base of the transfer was actually added by Reynolds in July 1973, before the creation of the SBDU, but there was a cross over period for many years that saw the earlier transfer remain in use for some time. The SBDU were not the only builders to continue with the use the original type of transfer well beyond 1973. From ‘mid to late 1977’ and up to the introduction of Reynolds 531c in 1982, the original data suggests that all the Reynolds transfers used by the SBDU were the type with the lower name box. In 1977 Reynolds changed their company name to incorporate the name of their owning/holding company, Tube Investments (TI), so from this point on, the name box displayed the new company name “TI-Reynolds Ltd”. The transfer should still be the sloping/diagonal 531 type. There was a short period in 1979 between approx SB2865 and SB3068, when the SBDU fitted the 531 4 Star type, but they reverted again to the sloping/diagonal 531 type. They again reverted to the 531 4 Star type for approx 100 frames just before the introduction of 531c. I can only assume that they used the 531 4 Star version in the absence of the standard 531 type? Most Worksop frames use the 531 4 Star as standard – the SBDU didn’t appear to. The image above shows the post 1977 style Reynolds 531 transfer. Note the 531 sloping style, note the detail of “TI-Reynolds Ltd” and note the position of the transfer which is approx 4-5 mm below the seat lug tip. You can also see how these original transfers deteriorate and break up meaning that they are often replaced, sometimes with the incorrect style. ** NOTE ** There is only a small amount of evidence that shows for a short period of time the SBDU used the 4 Star 531 transfer type. The 4 Star version was rarely used on SB TI 531DB frames. Contrary to their Reynolds 531 frames, all the data suggests that the SBDU only used the 4 Star version for the 531SL frame transfer. Reynolds did offer the sloping/diagonal 531SL transfer type but it doesn’t appear that the SBDU applied this to their 531SL frames. The image above shows the original transfer on SB5084 – also note the original position of the transfer, approx 4 mm below the tip of the seat lug. Reynolds 531SL started life in 1975 so it will always have the lower name box using “Reynolds Tube Co Ltd” up to 1977 and then “TI-Reynolds Ltd” from 1977 until the range changed in 1982 when the tubing was replaced with Reynolds 531 Professional. The frame location is still the same, 4-5 mm below the tip of the seat lug. There was always a lower name box on Reynolds 753 transfers, beginning in 1975 with “Reynolds Tube Co Ltd”. This is the first time that Reynolds incorporated the TI logo into the Reynolds frame transfer. Just with the 531 example, there was a change mid 1977 when the Reynolds company name changed. The earliest data I have to show the new Reynolds company name of “TI-Reynolds LTD” on a 753 transfer fitted to an original TI road frame is SB1680 (mid to late 1977). This style “TI-Reynolds Ltd” 753 transfer continued until the introduction of 753R & 753T in 1982. If you have a 1982 SB TI-Raleigh frame then you will need to confirm which tubing you have to ensure you fit the correct period Reynolds frame transfer… 531DB or 531c / 531SL or 531 Professional / 753 or 753R/T. ** Comment ** On an SB TI-Raleigh frame, the fork blade transfer on frames up to 1982 should be the circular TI logo (two different styles). From 1982 the correct fork blade transfer is the smaller Reynolds TI style with coloured numbering to match the tubing type. Just like the Reynolds tubing frame transfer, the style of fork blade transfer changed slightly over time but the location remained fairly constant. The first style of TI logo transfer had black lettering with black circles on a yellow circular background. This style was only in use for a short period from the start in 1974 until approx SB404 – SB435. Some of the frames I’ve seen have missing TI fork blade transfers and on some of these you can see the faded circular mark in the paint where the transfer once was. I have a feeling based on this that the fork blade transfer was often damaged and either removed permanently or replaced, sometimes with the later yellow lettering style. There are a couple of anomalies in my data that seem to corroborate this idea. From approx SB436, the TI logo changed to the more familiar yellow lettering and yellow circles on a black background. As with the earlier style, there are a few anomalies in my data and some frames in this later period use the older style black lettering. Again, there are only a couple of these anomalies so I’m putting this down to replacement transfers. SB frames continued to use the TI fork blade transfer until 1982 when the SBDU began to use the smaller Reynolds TI fork blade transfer. The first frame I’ve seen to use the smaller style Reynolds TI fork blade transfer on an original TI frame is SB4857, which according to my current timeline is right on the turn of the year between 1981 and 1982. I describe the new fork transfers as the “smaller Reynolds TI”, you can see an original example on SB5084 below. This style is different to the larger “Shield” type that Reynolds also produced for fork blades. All the fork transfers in the image above are original SBDU on original paint. The position is constant. The early SB frames had a fully sloping internal fork crown and the SBDU introduced a fully sloping internal Cinelli SC and SCA crown again in approx 1980. If you have a fully sloping crown then the position is approx 10-15 mm from the top edge of the fork crown – this can be difficult to judge on the smoother aero crowns. The two images below that I’ve taken from some original paint frames (non TI-Raleigh colours), show the type of position you should be aiming for. The five frames in the first image showing the TI transfer are all original paint frames dating from before 1982 (1976 – 1980). The two fork blade transfers in the second image date from after 1982 – they use the smaller style Reynolds TI fork blade transfer. The Cinelli CC crown was introduced slightly before the SC and SCA, it is an external sloping crown with a pointed tip that comes some way down the outside of the blade. If you have this type of crown then position the transfer approx 5 mm below the tip. The smaller Reynolds TI fork blade transfer is normally associated with the new range of Reynolds tubing (531c, 753R, 753T etc). But the SBDU had a small cross over period where they used this newer style fork blade transfer while still using the older style frame transfer. This cross over period lasted for approx 700 frames. They started using the new smaller Reynolds TI fork blade transfer from approx SB4857 but didn’t introduce the new style 531c/753R frame transfer until approx SB5552. SBDU frames eventually transitioned to the same style of frame and fork transfer. This is SB5794 below, a frame from the start of 1983 displaying the new Reynolds 531c frame transfer and corresponding smaller Reynolds TI fork blade transfer. ** NOTE ** The is little evidence to suggest that the SBDU made much use, if any, of the larger style Reynolds shield type fork blade transfer. There is no data at all to suggest they used the shield transfer before 1982. There is 1 anomaly out of 113 original paint frames that uses the larger shield style on the TI scheme and that was after 1982 (the 753R/T period). The down tube oval transfer is the one positioned between the gear levers, sitting just below the tip of the lower head lug. ** Comment ** Between SB1 and SB557 it is acceptable to use the “Campagnolo Prodotti Speciali” oval transfer. Between SB558 and SB4196 nothing seemed to be used. From SB4197 (end of 1980), use the 1980 TDF Winners transfer. For the first few years of the SB TI-Raleigh scheme very few TI-Raleigh frames had a transfer positioned on the down tube between the gear levers. There appears to have been a sporadic use of the “Campagnolo Prodotti Speciali” transfer from 1974 up to early 1976 (SB1 – SB557). But it was only used on a handful of frames and so far I haven’t been able to figure out why and when it would be used. The data shows that from early 1976 until the very end of 1980 there wasn’t a transfer placed in this location, this area of tube was left blank. The first original SB frame I have data on that used the 1980 TDF Winners transfer is SB4197. But I do have a gap in data between SB4134 and SB4197 so it could possibly have appeared at some point in this missing 63 frame range; either way, it was late 1980. I’ll not know for sure until I get more original data. The left hand image below is from SB3505 with original paint. The image on the right is from SB5084 with original paint. The red colour on original paint SB frames can fade badly but you can see on the left hand image that there are no faded areas, there is no evidence that this frame ever had any type of down tube transfer which helps to confirm my findings. The TDF 1980 transfer is normally positioned just below the tip of the lower head lug. Any frame from late 1980 (SB4197) up to late 1983 should have no problem locating the TDF 1980 transfer at the tip of the head lug and above the gear lever bosses. The original braze on position of SBDU gear lever bosses is approx the length of a gear lever from the tip of the head lug. Tip: if you have an early frame without braze on gear lever bosses, this is a good guide to finding the best position to clamp the gear lever band. But for frames at the very end of 1983 and through to almost the end of 1984 (approx SB6282 – SB6897), the situation changed when the SBDU drastically altered the location of the gear lever boss. They moved the bosses up towards the head lug by 40 mm. This meant that there was no longer any space for the TDF 1980 transfer above the gear lever bosses, and for this short period of time, the TDF 1980 transfer should be located below the gear lever bosses (you may still be able to squeeze it in if you have the shorter point Cinelli head lug on a Services des Courses frame). At the end of the SB6000’s the SBDU changed the position of the bosses again, for the final time. They lowered it from it’s newer, much higher position by 10 mm, meaning that there was now just enough space to fit the TDF 1980 transfer above the gear lever bosses once again, even with a long point Prugnat head lug. The image above is from an original paint frame, it is my 1985 531c Randonneur, SB7660. It is an excellent example to demonstrate the final repositioning of the lever bosses. This frame uses the same Simplex levers, same TDF 1980 transfer and same long point Prugnat lug as the 1980 TI frame above – you can see how much higher the levers are when you compare the top of the lever against the tip of the lug. For some 1984 frames, this lever position was even higher and it is obvious that the transfer would not be able to fit, there was simply no room. Although SB7660 is not in the TI colours, it is original. You can see how several of the points I am making in this blog post will apply to many other SB restorations. Note the position of the TDF 1980 transfer… note the position and type of the fork blade transfer, note the position of the ‘H’ of the Raleigh down tube transfer in relation to the lever bosses. It all fits into my research! For more information on gear lever positioning on SBDU frames have a read here. ** NOTE ** If your SB frame number is lower than SB4197 then don’t fit the TDF 1980 transfer. It date references frames. It isn’t just a case that this transfer wasn’t used earlier than the end of 1980, this transfer didn’t exist for earlier frames. ** Comment ** Before 1978 the down tube transfer should be “Raleigh”. After 1978 the down tube transfer should be “TI-Raleigh”. (More specific details below). If you are lucky enough to own an SB frame between SB1 and SB9 then you are not only very fortunate, you also have a certain type of frame transfer, specifically because of the font it uses. The original SB frames before SB10 have a similar font and style to the Worksop built Raleigh Team Professional shown in Raleigh’s 1975 catalogue. This font has no black outline and a slightly thicker black centre line. SB10 is a repaint so the original data starts again at SB19 and that is where the standard black outline font with a thinner black centre line starts from. The original wording on the down tube for an SB TI-Raleigh road frame was “RALEIGH”, you can see that in the image below. SB frames continued to use RALEIGH like this until 1978. I have a 46 frame gap in my data between SB1861 and SB1907, and the change from “RALEIGH” to “TI-Raleigh” happened at some point in this gap. SB1907 is the first original paint TI frame I have data on to use the new wording. Regardless of the age or type of transfer, the location is typically the same. The ‘H’ of the word Raleigh is approx 1.5″ below the gear lever boss. Remember, if your frame is the earlier type without gear lever bosses, the starting point for measuring the location of the transfer is approx the length of a gear lever from the tip of the lower head lug. You might think that this is a location where you could place a circular TI logo transfer without much need to check if it is right or wrong. Well it is partly correct to place a TI logo here, but it wasn’t always the case. And like some other transfers, the location changed slightly depending on the age of the frame. The earliest SB frames didn’t use the TI logo. Some frames don’t appear to use any transfer in this location. The data on the earliest frames is a little patchy, but a handful of the first 120 SB frames all have a transfer that links them back to their Carlton Worksop roots. This is a modification of a Carlton transfer, essentially the original transfer had the word ‘CARLTON’ positioned just above the triangle. It was removed when it was used on SB frames. (Thank you to Mike Jane at http://spokessmann.tripod.com/ for the use of his image). The start date for the TI logo positioned at the base of the seat tube is difficult to pin down because of the lack of frames. Original frames from 1975 are very difficult to come across. Early SB frames with original paint and transfers that show an intact TI logo are even harder to find. But by at least SB300 it appears to be in place, and just like the fork blade transfer, the earlier transfer was the black TI lettering with black circles on a yellow background which changed to the later yellow lettering type at the same time as the fork blade transfer. You can see in the image above that the TI logo was typically placed equidistant from the lower seat tube band and the top of the BB shell. The two frames in that image are from different years (1977 & 1980) and you can see how the transfer is placed in the middle. There aren’t any measurements for the best place to fit it as the location of the bottom of the the seat tube panel appeared to move up and down depending on frame size. But in most cases the TI logo was usually about 2″ above the BB shell. This position changed a little later on. From approx SB4700, the location of the TI transfer moved down the seat tube to a position just above the BB shell. The image above shows SB5084 from 1982. This is an original transfer in the later and lower location. ** NOTE ** Make sure you match the colour/style of the seat tube TI transfer and the fork blade TI transfer. Now this particular section may provide the most surprises. There are a couple of seat tube transfers that I’ve already looked into, the first was the Reynolds frame transfer and the second was the transfer at the base of the seat tube. Before I go into detail about the black and yellow panels together with the black and white bands, I need to cover maybe the most mis-used transfer, not just on a TI-Raleigh, but any SBDU restoration. Over the years I’ve found that there are several transfers which are used in the wrong way on SBDU restorations. There is an over use of the 4-star 531 transfer, or fitting incorrect Reynolds fork blade transfers, and also adding the TDF 1980 transfer on frames built before 1980. But the transfer I am adding to this list now is the GVO’D transfer. There is huge appreciation and undoubted respect for Gerald O’Donovan and the work he did at Carlton and then the SBDU. His knowledge and work with frame design and frame materials is second to none, but his famous oval shaped GVO’D transfer does not feature on an authentic 1974 – 1983 TI-Raleigh frame. Some people might think that I’ve just said something blasphemous! I haven’t, it is just a simple fact. Every single original paint frame in TI colours built with an SB number between 1974 and 1983, that I have seen does not have this transfer. I’ve only seen one original SB numbered frame in TI-Raleigh colours that displays the GVO’D transfer, and that frame was built in 1985. The image I’ve used above features a red 531c frame from 1985 and a blue 753R frame from 1988. Both are original paint and both feature the transfer. The GVO’D transfer has lots of internet stories surrounding it, and one thing I pride myself on is that I don’t rely on internet stories as a basis for what I write in my blog posts – I prefer fact. The fact is that this transfer didn’t start appearing on SBDU frames until after the start of 1985. 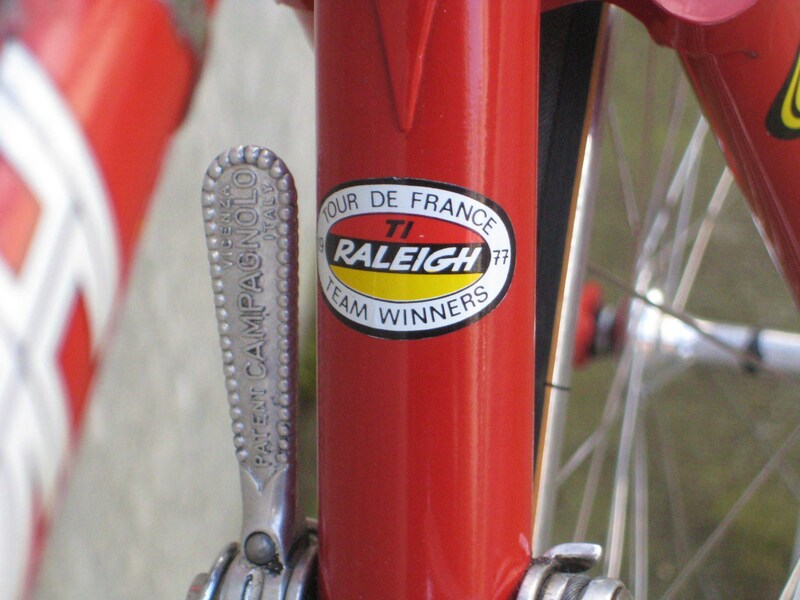 The wording “RALEIGH” reading down the seat tube remained constant throughout the TI-Raleigh era. The black colour at the centre of the seat tube remained constant and the appearance of the two yellow panels also remained constant. But as you will see in section 10, the process of achieving that red black and yellow seat tube changed a couple of times. First up is the most significant feature that I think most may not even have noticed, it is the black and white bands that cover the joins between the different coloured panels. There is no data for SB1 to SB5 so I’m starting my research at SB6. The main point to note about this era is that there is no black and white band directly above the ‘R’ or below the ‘H’ of the RALEIGH transfer. There are only two black and white bands, they only appear on each red/yellow paint join. These bands are a small transfer strip and at first I thought they were missing due to the bands deteriorating and falling off, but then each of the original frames in this period that I looked at was the same. The image above is SB447, it clearly shows that there are no bands at either end of the black centre panel, not even a part worn band, or any sign that there was ever a band in those locations. I have a gap in data between SB1269 and SB1610 so I’m starting this section at the next known point which is SB1611. Although they had different ways of achieving it which you will see in section 10, the SBDU introduced the more recognisable ‘four’ black and white bands, one band at each paint join. This is the look that most will recognise and that most will have done during a restoration. The positioning and lengths of the seat tube panels from the start of the SBDU up to approx 1981 appear to be a similar length regardless of frame size. The average length of the overall yellow panel inclusive of bands is 5 – 5.5 cm. Because the length remained fairly constant, it means that the lower yellow panel and lower black and white band can end up in one of three locations depending on frame size, either well below the front derailleur clamp, actually sitting directly under or very close to the clamp or above the clamp. The location of the lower band appeared to revolve around what I can the medium SB frame size of 56/57 cm. If you think of the typical full centimetre size range the the SBDU built in over the years, then 56/57 cm is central. (size 49 and 64 was not always offered). It should be noted that this summary isn’t 100% accurate, but most frames will fit this pattern. The problem is that there just doesn’t seem to be a uniform starting point for the top of the yellow panel, it varied a little, but most frames (not all) will fit into the three ranges above. The era of the braze on front derailleur! This chuck of metal brazed to the side of the seat tube obviously had an impact on seat tube panel positioning, and for frames with this fitting, the area of seat tube available for panels and transfers was restricted. The SBDU mentioned that a “brazed on front changer” could be fitted “at extra cost” in their 1982 frameset information (published November 1981). The earliest original frame I’ve seen with a braze on fitting, and which also happens to be in TI colours, is SB4994 dating to the start of 1982. It is a relatively small frame, I don’t know the size, but it would definitely feature in the smaller range of sizes on left hand side of my size scale. The front derailleur braze on fitting isn’t the only item that reduces the available space on the seat tube, the Reynolds 753R/T/531c frame transfer is also slightly larger than the transfer it replaced, so on a smaller 1982+ frame with a braze on fitting and larger Reynolds transfer, the yellow panel has to be reduced to fit the available space. This is the first time I’ve seen the length of the yellow panels reduced – it has to be the yellow that gets the adjustment as you cannot reduce the black space required for the “RALEIGH” wording. The typical length of the yellow panel is 4 – 4.5 cm and about 5.5 – 6 cm in total including the bands depending on exactly where the bands have been fitted. On large frames, something in the size of 60 cm+ the lower panel and band could easily be an 1″ above the front derailleur and there will still be a good amount of exposed red seat tube – that is normal for this size of frame. One of the main mistakes made during a restoration is making the yellow panel too narrow. ** Comment ** On TI frames up to the end of 1981, don’t be afraid to position the bottom of the seat tube panel below the front derailleur clamp – it was normal for this to happen on frame sizes of 56/57 cm of less. ** NOTE ** Only reduce the size of the yellow seat tube panels if it is necessary. It should only be necessary on frames from 1982+ which are approx 49 – 55 cm. Too many restorations are automatically using a reduced yellow panel, even on large frames. Do not fit the GVO’D transfer to any frame dated before 1985. I’ll cover more of the seat tube transfer scheme in section 10 called “Paint Process“. If you are lucky enough to own an SB frame between SB1 and SB9 then you are not only very fortunate, you also have a certain type of frame transfer, specifically because of the font it uses. The original SB frames before SB10 only have “TEAM” on the top tube, similar in font and style to the Worksop built Raleigh Team Professional shown in Raleigh’s 1975 catalogue. This font has no black outline and a slightly thicker black centre line. I never want to confuse my SBDU ramblings with details of non SBDU bikes. The only point I’m making a connection to with the image above is the type and style of top tube transfer. SB10 is a repaint and there is no data for SB11 through to SB14, SB15 is the first known original frame with “Team Raleigh” on the top tube. The rest of this section applies to frames from SB15 onward. ** Comment ** Between SB15 and the start of 1978, the top tube transfer should be “Team Raleigh”. After 1978 the top tube transfer should be “Team”. (More specific details below). SB1861 above showing the correct top tube transfer for a pre 1978 frame – this is combined with the correct pre 1978 down tube transfer. The style of transfer and font has the black outline and thinner centre line, a style of font used since SB15. SB3505 above showing the correct top tube transfer for a post 1978 frame – this is combined with the correct post 1978 down tube transfer. So the style of top tube transfer is relatively easy enough to figure out, but It is difficult to judge a correct position of the top tube transfer from the images I’ve been sent of original bikes, they are often photographed at angles. The image of SB1851 that I’ve used above with Team Raleigh on the top tube is a good example of how an angle can distort things. Because the frame is at a slight angle you just can’t tell where the top tube transfer is in relation to the down tube transfer. The black line is positioned at the lower point of the ‘H’ on the down tube – the top tube transfer is approx 1.5″ behind that line. Again, there is approx 1.5″ setback for the top tube transfer. Another point of reference on later frames like SB3505 with brake cable stops is the distance that the top tube transfer is setback from the first brazed cable stop, a gap of approx 1″ is typical. Some of the early 100’ish bikes have little or no setback but it definately became the norm to position the top tube transfer slightly further back. Most of the original frames I’ve looked at where I’ve been able to see a good clear view of the side of the frame support my opinion about a setback on the top tube transfer of between 1″ and 1.5″. ** NOTE ** Very few, if any original SB frames, have no setback on the top tube transfer. Some frames have transfers that have deteriorated too much to judge. ** Comment ** On an SB numbered TI-Raleigh frame, the Specialist Bicycle Developments transfer should only be located on the chain stays. This is probably one of the most iconic Raleigh transfers, it was used on 99% of their SBDU frames but in different positions depending on the paint scheme. For the SB TI-Raleigh scheme, it was placed on each chain stay. However, it wasn’t always used, and when it was, it had a few different locations along the chain stay depending on the age of the SB frame. The actual start date for when the chain stay transfer was introduced is a little vague. However, there is just about enough data to suggest that it was sometime between SB405 and SB435 – this is a similar time period to the switch in black and yellow lettering on the circular TI logo fork blade transfer. There are a couple of anomalies in the data where some earlier frames have this transfer, but these appear to be possible later additions as the position of the chain stay transfer looks to be wrong for the period of frame they are fitted on. But from approx SB436, the original data definately shows that the TI-Scheme consistently used the “Specialist Bicycle Developments – Raleigh Ilkeston England” oval transfer. The location was approx 9.5 – 10.5 cm (95 – 105 mm) from the chain stay socket of the BB shell. The frames below are SB1861 and SB3505. It remained roughly in this position until approx SB4500 (mid 1981) when it was moved further along the chain stay by about 30 mm. The new location was roughly 14 – 14.5 cm (140 -145 mm) from the BB socket. The frame below is SB5084. You can see a clear demonstration of the two different periods I’ve mentioned in the image below. This is comparing two earlier frames with a later frame. The front two frames are in original paint from 1979 and 1980 and the rear, third frame, is an original paint mid 1982 frame. The difference is clear to see. In late 1982/early 1983, the SBDU oval chain stay transfer appeared to make another move and can often be found approx 16 -17 cm (160 – 170mm) behind the chain stay socket of the BB. ** NOTE ** Don’t position the transfer directly on the face of the chain stay or directly on the top of the chain stay. It should sit somewhere between the top and side. The most common position I have seen is to have the red stripe of the transfer sitting on the top centre line of the chain stay. 40 year old original paint frames can come with lots of chips and scratches. The frames I’ve looked at have quite a few and this has given me some insight into how these frames were painted as layers of different colours have been exposed. It’s been a bit like watching a programme of Time Team when they unearth different sections of wall or floor and try and figure out which was laid or built first. From 1974 to 1983, based on the layers of paint I can see on some of the original SB frames, I can see that there were at least three different times that the order in which the red black and yellow colours were applied to create the TI colours changed. Sometimes the red went on first, sometimes the black went on before the red, and sometimes the yellow went on first… and sometimes, the yellow wasn’t even paint at all, it was a transfer! Unfortunately, there just isn’t enough original data on the first yellow head tube bikes to be able to define a process, so I’m starting at the accepted starting point of the black head tube SB frames. I’m only covering the 3 main colours and not any base coats, clear coat or time in the oven. Every single original paint SB TI-Raleigh frame I’ve seen before SB1611 only has the uppermost and lowermost black and white band (there is no band on the join above the ‘R’ or the join below the ‘H’ of RALEIGH). I mentioned earlier that it doesn’t even look like they have fallen off, there isn’t even a remnant of a deteriorated band. You can see in the image below how these bands can break up and fall away, but the original paint frames in this period don’t show any evidence of the same remnants at either end of the black panel, there is nothing. There are several examples of frames in this period that show red under yellow and yellow under black indicating that the layers were applied in that order… Red > Yellow > Black. You can see a couple of spots of red under the yellow upper panel above (Step Three from Process One). This seems to be a very short lived process. I have a gap in my original paint frame data between SB1269 and SB1610 meaning that Process One could have actually continued for a bit longer. Likewise, Process Two could have started a few hundred frames earlier. Hopefully one of the missing 300’ish frames will turn up at some point to help narrow this gap and add a bit more detail. Because of the gap in my data, I’m starting Process Two from a point that I know to be correct, SB1611. There was no yellow paint in this process. It was also the first time that the seat tube had 4 black and white stripes. The left hand image above shows the join that runs down the back of the yellow transfer that forms the yellow seat tube panel. Unfortunately, you can see what often happened to these transfers – they got crushed under the front derailleur clamp. So although it was a quicker process and meant fewer paint applications and less time in the oven, it may have been short lived because of the front derailleur clamp problem? You can also see that the black and white stripes were part of this yellow transfer and not individual transfers. There is also hint of red paint under the yellow panel in the right hand image (Step Four from Process Two). The image above shows the front of the yellow panel transfer. You might be able to make out the small black mark at the top and bottom that could have been used as a marker to ensure the transfer went on level and square. The left hand image also shows how the red under the black panel has been exposed (Step Three of Process Two), demonstrating that the red was applied first. Process one and process two both involve applying red to the frame first. At some point the head lugs are then masked before the head tube is painted black. The image above clearly shows that the outer surface of the lug was masked leaving the inner edge of the lug adjacent to the tube exposed. When the head tube is painted, the black paint extends to this exposed edge of the lug. You can see the clear line of black, almost as if it was a black lug line. You can also see red paint visible under the black confirming the order in which the paint was applied to the head tube (Step Three from Process Two). This is probably the process that most people will recognise – the end result will look 99% the same as process two. It is almost a complete reversal of process one and two as the red goes on last this time. You will see a slight difference around the head tube between process one and two and process three due to the difference in masking and order that the colours are applied. In process three it will typically be JUST the head tube that is black as it appears It was only the actual head tube that was masked, the masking didn’t extend to cover any surface of the head lug This left the entire head lug including the edge of the lug next to the tube exposed to the red paint. The seat tube in the left image above is SB3505 and the seat tube on the right is SB5084. Both of these frames are from the Process Three period where the yellow went onto the seat tube first. The left hand image shows a couple of chips that have exposed some bare metal then yellow then red, the small chip above shows yellow peeking out from underneath the red too. The image on the right has a few chips on the black centre panel and you can see yellow beneath the black in a few areas. The yellow in the left hand image is also way down at the base of the seat tube, only about 2″ above the BB – that demonstrates the extent of coverage for the first yellow coat, they didn’t appear to be just putting enough paint on to create the yellow panels. According to other original frames that I’ve seen during the research for this project, the painters must have sometimes covered most of the seat tube with yellow paint as I’ve seen some frames that have chipped seat stay caps and the yellow is evident below the red on the caps. The application of the three colours in this order corresponds to an article published in Cycling in 1982, describing the creation of the yellow bands first, followed by the black seat tube panel and black head tube, before the remainder of the frame and fork was painted red. I would never say that the SBDU were flamboyant in their frame detail. Their frames were beautiful, and by that I mean beautifully simple. There may have been the occasional Capella lug, different fork crown and even the occasional ovoid tube from time to time, but mostly, they were functional machines, built for a purpose and using materials to achieve that purpose. It was the TI-Raleigh paint scheme that made them stand out from the crowd. However, for a limited time, they did throw caution to the wind and they found a few spaces on some earlier SB frames for a little touch of paint detail! It was difficult to detail an early 531DB road frame as there was simply nowhere available. Lugs were plain with no cut outs and fork crowns were chromed. The first detailing I’ve seen on an original SB frame is SB436 which is a 531DB track frame. There may be earlier detailed track frames but early track frames are difficult to come across. My own SB447 had a detailed Fischer fork crown. The earliest detailing was limited to yellow only. The S4 type lug with the triangular cut out window was a favourite; it was the appearance of this type of lug on Reynolds 753 frames at the end of 1975 that kick started the detailing period. The contrasting yellow detail spread to head lugs, seat lugs, brake bridges and fork blade stiffeners, all these fittings received the contrasting yellow paint detailing attention. So the earliest original detailing I have data on was from approx SB436 to SB805 (it could possibly have been on earlier frames but there just isn’t enough data at the moment). This frame number range would have included 531DB track frames and 753 track and road frames. The only colour used in the detailing was yellow. The areas on the 753 frames that were detailed yellow were the head lugs, seat lug, fork blade stiffeners, and the small cut outs in the rear brake bridge stiffeners. The 4 slot BB shell which was in use at the time on 753 frames didn’t appear to receive any detailing. And then from approx SB800, 531DB frames received the same S4 type lugs, and the detailing spread across to 531 frames. Black was introduced as a contrasting detail colour to the yellow. Most frames in this period had the semi sloping fork crown which didn’t have cut outs or recesses that could be detailed. A couple of frames had Haden crowns, these seem to have black in the front and rear recesses and yellow in the cut outs on the underside. There is one anomaly for the 4 slot BB where is is painted Yellow > Black > Black > Yellow, the reverse of all the others. There are a couple of anomalies in the data, two frames after SB2003 have lug detailing, but both don’t fit the standard pattern used on SB frames, the colouring may have been added later. I do know that colour was often added to some frames outside of this period. From SB2004, the detailing of lugs and frame fittings stopped. You may have noticed that this frame number ties in exactly with the start of “Process Three”, the third paint process I mentioned earlier in section 10. It wasn’t long after this frame number that the SBDU introduced the Prugnat 62 lug to their 753 frames, and a little later the 4 slot BB disappeared and these two changes may be another reason why lug detailing ended. ** NOTE ** Not every part of a TI-Raleigh SB frame that has a cut out or a recess or a slot should be detailed with contrasting paint. It was only done for the first few years, stopping in early 1978. While it lasted it definately appeared to follow a pattern. Lug detailing really took off with the early 753 frames. Yellow was used to add detail to the cut out lugs and fork/brake bridge stiffeners. At about SB800, 531DB frames also started to receive lug detailing as the 531DB frames started to be built with the same S4 type lugs. Instead of only using yellow, the TI scheme began to use a mix of black and yellow detailing. This little splash of colour detail stopped by SB2004. This is my 1980 TI-Raleigh Team Pro 753, SB3800. This frame is meant to have had a racing past, being raced by Joe Waugh in the very early 1980s. From what I understand, it wasn’t painted in Raleigh colours during this period but was repainted before being sold on in the mid 80s. It was repainted in the TI colours and is an excellent example of good quality paint from an experienced painter. Because it was repainted in the early to mid 80s, the transfers they used are original examples and beautifully thin, almost non-existent when you run a finger across the paint and over the transfer. The paint is now well over 30 years old and is still perfect. To the casual eye, this would pass as a surviving original bike. However, even though the paint is in good aged condition, when you look in detail and compare each transfer on this frame to my guide, you can see clues that point to this as a repaint. Point 1: In it’s racing days, this frame was probably in Joe Waugh livery and it used an adhesive head badge. As there are no available holes in the head tube, rather than drilling 3 new holes, the painter has used the large oval alternative Raleigh Heron. Point 2: This is a 1980 frame so the large shield type Reynolds fork blade transfer this frame came with is wrong, I replaced these with the correct later style yellow lettering TI logo to match the seat tube base transfer. Point 3: The seat tube base transfer is ok, slightly low for this period, but ok. The base of the yellow panel is reasonably ok for this size of frame. Point 4: The Reynolds 753 frame transfer is an original authentic type transfer and uses the correct Reynolds company name of “TI-Reynolds Ltd”, but is is positioned too low. Rather than placing it approx 4-5 mm from the seat lug tip, it has been placed in the middle of the area between the upper band and lug tip. Point 5: The SBDU chain stay transfer is also too close to the BB meaning it is too close to the chain ring. Point 6: This is a 1980 frame but it shouldn’t have the TDF 1980 down tube transfer – this didn’t appear for about another 400 frames, until approx SB4197. Point 7: Finally, the “TEAM” transfer on the top tube is the correct style but approx 2″ too far forward. It has been positioned about 1″ in front of the first brake cable stop but should be about 1″ behind it. I think the only item on here that could be considered correct is the TI-Raleigh down tube transfer – it is the correct style and in the correct location. All things considered, it is still a very good job, I’ve been hyper-critical and some of the transfers are only slightly out of place. I’ve seen so many more restorations that not only suffer from poor paint but also poor choices for the type and location of transfers. Where do you start with replacement transfers? There appear to be so many on the market, ranging in quality from excellent to quite poor. You may have had the best paintwork money can buy, but fitting bad quality and poorly designed transfers will definately impair the final overall result. I mentioned in the opening paragraphs that Raleigh reproduced the TI scheme on a range of non SBDU models and some of these transfers will end up being marketed and sold as replacements, often in sets, and used on other models, frequently on SB frame restorations. I feel that some replacement transfers are copied from either similar replacement transfers where errors are reproduced, or they are based on aged and worn original transfers where original colours may have changed or faded. The left hand image above is the a new replacement but it has a silver border, it should be gold. The original foil transfers do age and fade and a once beautiful gold transfer can turn to silver after years of exposure, oil grease and cleaning products – you can see this aged look in the right hand image above. If whoever designed the new replacement used something like this old worn transfer as a basis for their design you can see why they can get the colour wrong. These are another two replacement chain stay transfers. The left hand image isn’t just an out of focus picture, it really is that blurry, the detail and sharpness are terrible. The gold border is at least better than silver but the excess gold that creeps past the black outline isn’t good. The right hand image however, is the type I use. This is a ‘Nottingham’ SBDU style (I didn’t have any spare unused Ilkeston versions to hand). The gold foil, colours, crispness and sharpness of the right hand image are all good reproductions of a ‘new’ and ‘original’ transfer. Most readily available replacement transfers are vinyl versions of what was probably a water slide or varnish fix original. No matter how thin you make the vinyl you will never get the same appearance, you might always get an ‘edge’. I didn’t have an original Reynolds 753 frame transfer handy but did have one of the original larger shield style fork blade transfers, I fitted this side by side with a later replacement 753 fork blade transfer as an example. The left hand original has no detectable edge but you can see a small white edge on the right hand image. The 753 frame transfer above is an original Reynolds version fitted to a repainted frame. It is my understanding that these weren’t clear coated originally and you can see that this one wasn’t either when the frame was repainted. It shares the same dull and quite matt appearance as the original fork blade transfer above it, they aren’t rich and glossy. The 753 frame transfer has survived really well considering it was fitted in the mid 80s and the bike has been used well since then, being handed down from father to son to use. Most modern replacement vinyl transfers will recommend a coat of lacquer to protect the colours from general everyday use, sunlight and the chemicals used to clean bikes. One draw back of applying lacquer is that it can sometimes be applied too thick. What are your choices… Preserve, Restore or Renovate? Don’t be afraid to ride a bike with history and provenance and that carries a few scratches, chipped paint and rusty areas. Chipped paint and any rust can be addressed and partially worn transfers can often be stabilised. You may just want to replace transfers on an original frame or if you think your frame is too tired then you might want to return it to it’s former glory. Before you send a frame away to be restored, take some photos and make some measurements. Give the restorer a copy of these, talk to them about what you want – they should be able to work with your images and measurements to give you a restored frame that matches what you originally had. It won’t be original paint but it will be a faithful period restoration. You might have something other than a TI-Raleigh that you simply want to paint in the red black and yellow colours and not be too concerned about the detail. Or you might just want to update an old TI with a fresh look. You might have a pre 1978 bike with “Team Raleigh”/”Raleigh” and TI logos but want a later mid 80s look. You might add braze on fittings, change gear cable routing or even cold set to accept a wider hub. At the end of the day it is your frame and your call. There are only a few remaining original frames. If you do decide to paint your TI-Raleigh frame then please spend some time and research a selection of restorers able to perform this task for you. Look at their work, look at their history, find previous examples of their TI work, ask them questions. Most of the best restorers are still frame building and have a long history of frame building. I strongly believe that whoever you choose should have the depth of knowledge and experience to help guide you to get your frame back to how it should be. Sometimes the best will cost, sometimes the best will take time, sometimes a little extra cost and a little patience is well worth it. And finally finally… thank you for reading through all of this, it was a mammoth effort to research and write and I appreciate that it was a mammoth effort to read down to this point. I don’t know if you will find it interesting or needlessly fussy. I never like appearing to come across that I’m preaching my own opinion, I’m not, I’m just trying to get across the original details. I know that owners will restore their frames, I just want to give everyone the best chance to do their frame justice. Next Next post: A Review of My SBDU and TI-Raleigh 2017 Ramblings. Well done. Fantastic piece of work in studying & documenting all of this. Have you ever taken the time to produce your own vector art of the decals so that you have a record of these. That was great to read. Solved some questions I had.Thanks Neil! On the lookout for what a correct badge should be on the down tube I came across the picture below. Do yo know where that was used? Thank you for the comment 🙂 I’m glad I’ve been able to provide a few answers. I’ve not seen that specific transfer used on an original SB numbered TI bike. It’s probably from a similar type of TI scheme used on another Raleigh model. Any SB bike up to SB4197 (unless it is really early) will not have a transfer between the levers from what I’ve seen. In Ilkeston – and very close indeed to Digby Street – was Skil Enamllers. It is my understanding that they finished all or most of the SBDU’s frames. Do you know whether this is the case in fact Neil? Certainly they worked to a high standard as the finish on one of my special order frames (from Nottingham and after the move so not an SBDU frame) can attest.